Don’t miss these 11 helpful content marketing and public relations tools! This convenient tool is a fantastic way to create images and graphics, videos or web stories. You can use it for free, as long as you don’t mind Adobe Spark adding their branding at the end of your video, or you can upgrade to remove it. This tool has a wide range of templates you can customize into the exact piece of content you want, whether you plan to post it on your business’ social media channels, include it in a blog post or add it to your website. Want examples of this tool in action? Check out this video I made about the difference between a media pitch and a press release, or watch Beth Adan’s video about social media trends below. As you can tell, this tool provides a lot of helpful information! If you don’t want to invest in a subscription, we’re happy to talk to you about ways we can use this tool on your business’ behalf. This is another awesome tool for creating custom images! I use it nearly every day for Three Girls and our clients – in addition to some of my own personal designs (my husband and I even printed a custom canvas for our home based on a poster I designed in Canva). With Canva, you can start with their design templates and customize it to fit your business’ branding. You can also design your company’s images to add to the design. I’ve included a few various images our team made using Canva; visit our Instagram page for more! Do you ever wonder how strong your email subject lines or blog post titles are? Now there’s a tool that can help! CoSchedule’s Headline Analyzer looks at a variety of factors (the words you use, the length and the sentiment) and provides a score to give you an idea of its strength. For content marketing, this is a great way to make sure your e-newsletter subject lines and blog post titles are likely to appeal to consumers. As you create content, spend some time putting in different titles and testing which ones score well. In addition to the score, pay attention to why they receive each score. This will help you bolster your title-writing skills, plus a lot of the same principles can carry over to the social media updates you write. This tool is also useful for public relations! When you write your media pitches, try a few different possible subject lines to see which ones score well and are likely to entice journalists to open your pitch. One important component of social media marketing success is consistency. How can you make sure you post updates regularly? Write them in advance and schedule them to go live at a later day and time! Hootsuite is a fantastic tool for this. They have various versions of free and paid accounts based on the way you want to use their services. Although some companies simply take a “one and done” approach to their social media, where they push the same update through to all their platforms at once, at Three Girls we stress the importance of different updates for each social channel. Each network is different; an update that’s written for Twitter is not appropriate for LinkedIn. Hootsuite allows you to connect your company’s various social media accounts and schedule updates to each one at various days and times. This means you can take an image or article you want to share on all your platforms, write a unique update for each one and schedule it out to go live different days and times. Then you don’t need to worry about remembering to push the update through, either. Just turn on your notifications and keep an eye on engagement so you can respond to followers’ questions or comments. 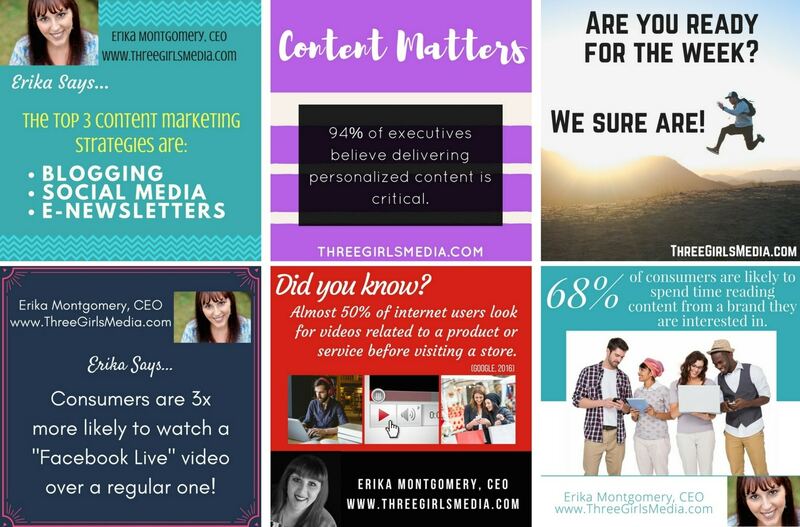 Research shows e-newsletters continue to be an effective component of content marketing. How can you manage your database of contacts while sending sleek, user-friendly emails? The good news is you don’t need to be a graphic designer or website expert! MailChimp provides a lot of helpful tools, and can even integrate your email campaign with social media advertising and more. It takes a bit of time to wrap your head around how to use it, but their plans have a variety of price points, including a free option, making it an affordable tool if your budget is tight. Although this tool isn’t free, it does have a few really cool features! Unfortunately, Hootsuite doesn’t offer a way to schedule Pinterest updates (or pins). Tailwind does! This content marketing tool only integrates with Pinterest and Instagram, but it can be really useful. In addition to scheduling updates, you can use it to research which times will be best for your posts to go live based on when your followers are most active. It also helps you find hashtags that would be useful for your brand. HARO is an incredibly valuable tool when it comes to securing media coverage! Everyone’s an expert at something. Sharing your expertise may land you that big media opportunity you’ve been looking for! Journalists post specific queries and you respond directly to them if you are a good source for their needs. From The New York Times, to ABC News, to HuffingtonPost.com and everyone in between, nearly 50,000 members of the media have quoted HARO sources in their stories. Every day, our team of publicists carefully looks through their daily digests of media queries from HARO, looking for appropriate stories to respond to on behalf of clients or themselves. In fact, nearly all the media coverage we secure for Three Girls’ team members comes directly from these queries. If you can’t afford a subscription to a major media database like Cision, this is another way to go after media coverage. Do you ever wonder where your time goes? Content marketing and public relations are two activities that can easily take over your day. It would be helpful to know if you’re performing the tasks efficiently to make sure they’re worth your time, right? Toggl can help you out! This simple timer is incredibly easy to use. You literally go to the website (or download the desktop extension) and click a button to start or stop. You can also add times in later, so if you’re away from your computer or forget it’s easy to fix. As you use Toggl, include descriptions of what you’re doing. Then, at the end of the week, you can look back at how you used your time and see how much time it’s taking you to create content, engage with consumers or research media contacts. Your time is valuable; it’s worth it to make sure you’re using it efficiently! Another helpful business tool that is incredibly useful for content marketing and public relations is Trello. This is another resource that takes some time to wrap your head around, but it’s worth it! Basically, Trello is a project management tool that allows you to virtually share updates and progress with team members. You create different teams for each client or project, and within those teams you can create boards, lists and cards. You can post messages, upload files, set deadlines and more. This tool is a fantastic way to share resources and manage projects with team members that aren’t necessarily in the same location. 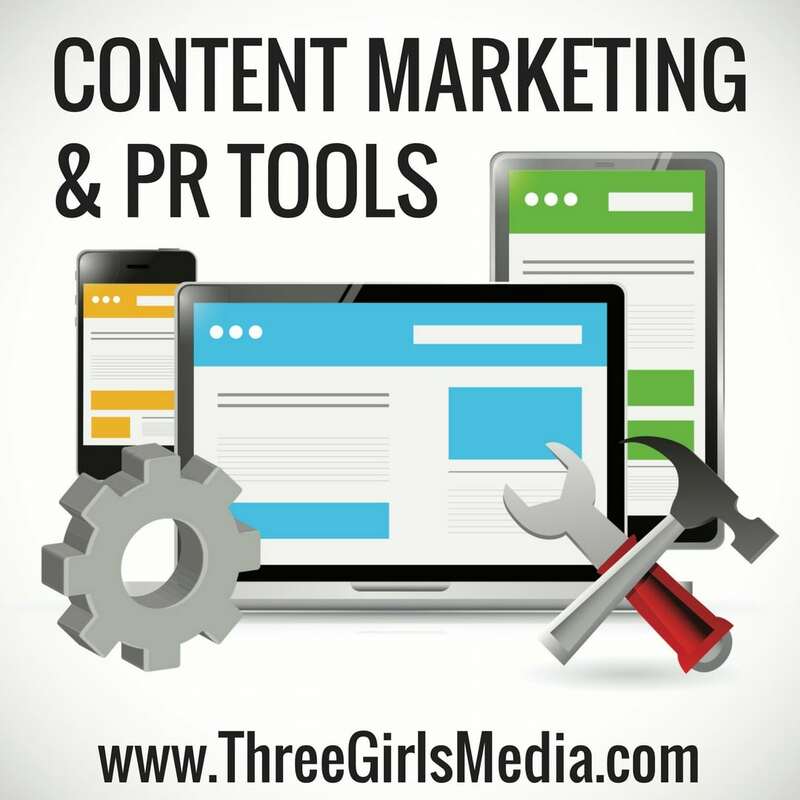 As you can see, there are a lot of tools that can aid with your public relations and content marketing efforts. Have you heard of any other resources you’d like an opinion on? Share them in the comments and I can offer some feedback! This article was written by Emily Sidley from Business2Community and was legally licensed through the NewsCred publisher network. Please direct all licensing questions to legal@newscred.com. Next articleCould You Benefit from Hiring a Professional Resume Writer?